Reitnouer Trailers manufactures aluminum flatbed and drop deck trailers. Reitnouer’s unique build style involves the implementation of bolts versus welding because, as Reitnouer’s research and experience shows, welding aluminum alloy reduces the aluminum’s tensile strength. Bolting makes Reitnouer trailers stronger and more durable. 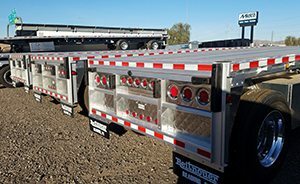 Midco Sales is the Reitnouer Trailer dealer in Arizona, selling Reitnouer flatbed trailers and parts as well as providing warranty repair service.